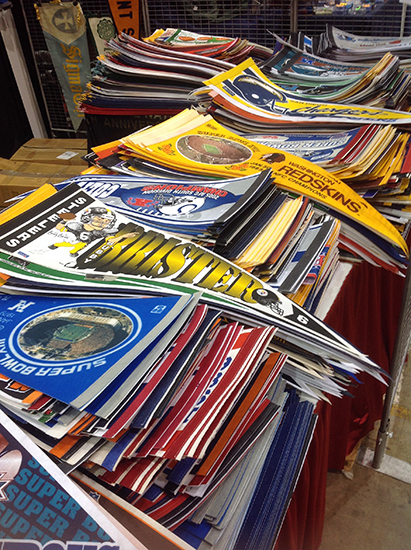 The 2014 National Sports Collectors Convention has come to a close. And from the perspective of this first-time attendee, Cleveland rocked. There was plenty to see, do and, of course, buy. I went prepared to be overwhelmed and I was still floored by the sheer size of it. 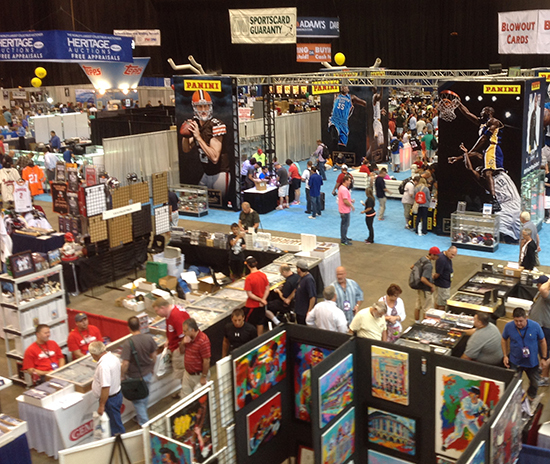 Have you ever been to a card show with a Ferris Wheel set up in the middle of it? 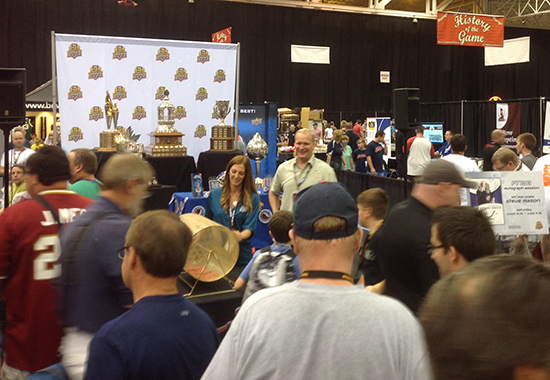 Besides the many dealers, all the major manufacturers were set up, offering face time and special cards to collectors. Each took their own approach to finding ways to drum up interest and to try to create some excitement. 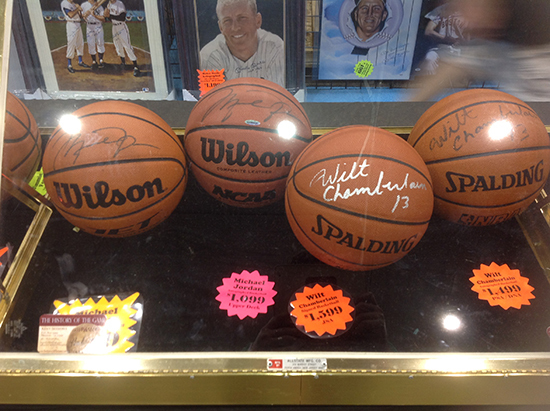 The autograph pavilion at the front of the show brought in lots of athletes and sporting greats. Since I was focused more on the cards, I missed a lot of this part of the National. That said, every time I walked by there were lineups. With my first National in the books, here are five takeaways that are still lingering in my mind even after a long trip home. While the hook for the National is cards and memorabilia, it's really about the people. 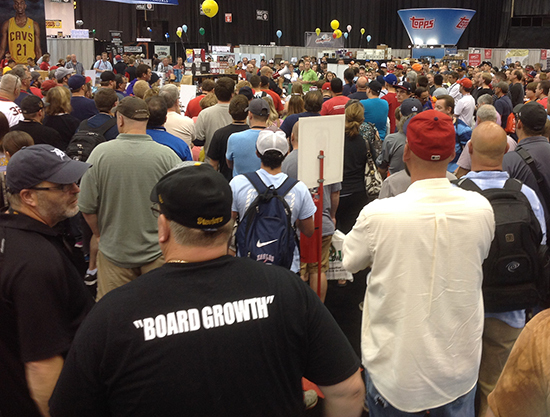 In this day of Twitter, message boards and other social media, the sense of community in the hobby is strong. But the biggest highlight for me at the National was being able to connect faces to avatars and shake hands with people I feel I know pretty well but hadn't seen face to face. I also got to meet new people and make stronger collecting connections. And even with all these meet-ups, I know I still missed a few people, which is one of the only regrets I have from the trip. Box breaks and case breaks are here to stay. The concept is still relatively new to many and it's still shaking down. In the years ahead, I think we're going to see some changes and it will evolve, but they're not going away. 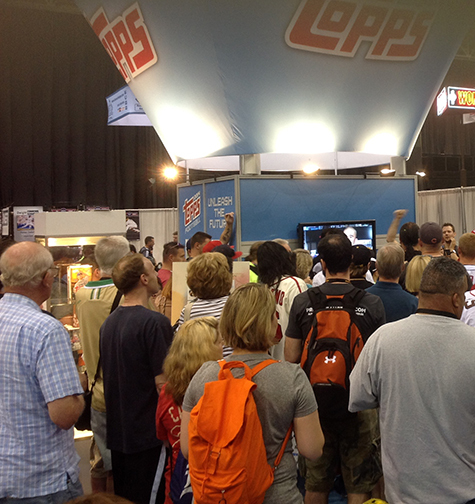 The National's Case Break Pavilion introduced a lot of collectors to the idea. Even if some of the booths didn't draw huge crowds, all the breakers I spoke with were pleased because a lot of their sales were covered through their online regulars before they could even open it up to attendees. Box breaks were happening on a special main stage from the time the floor opened until the lights started going out. MC-ing most of these were the Cardboard Connection Radio crew who were going nonstop. 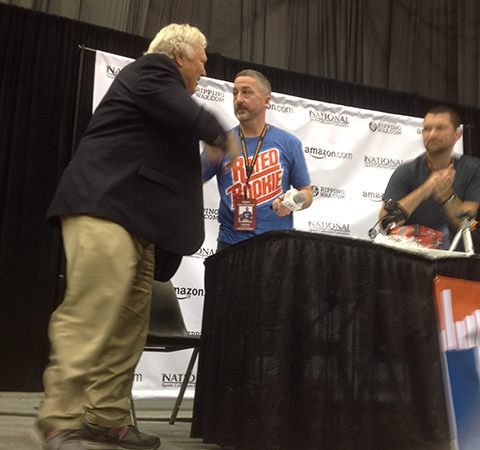 Among the highlights were breaks with NHL Hall of Famer Bobby Hull and Cleveland Indians great Carlos Baerga. 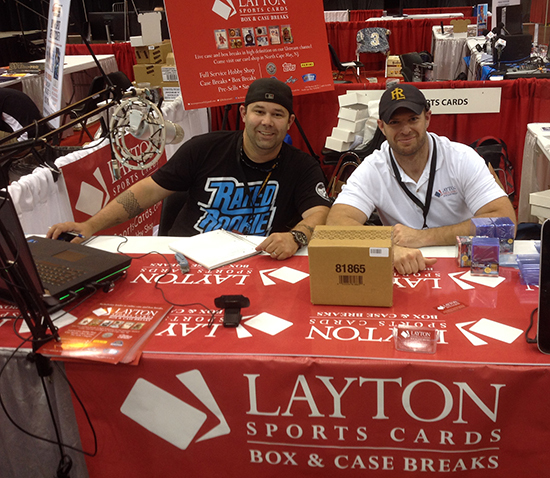 The first case of 2013-14 Panini National Treasures Basketball was also busted on the Amazon.com main stage. I went to the National expecting to make some massive dents in my want lists. Even with 38 printed pages, it didn't happen. The biggest surprise for me came with the types of cards that were available en masse. If you were looking for the newest products, particularly boxes, it was easy. If you're into vintage, there was tons of that as well. But what about the in between? The stuff I was looking for wasn't exactly high-end rarities. Rather, it was lots of sets and singles from the mid-1990s up until now. The newest baseball sets I was able to largely take care of. But no 2003 Topps 205 Polar Bear Minis, no 2006 Topps Allen & Ginter Danica Patrick and no early-2000s Montreal Expos. Like any show, there was no shortage of deals. Even though I struggled to find things on my want lists, there was lots to spend my money on. From cheap boxes to a couple of Hall of Fame autographs, I came home with plenty I'm happy to add to my collection. Dealers were, for the most part, willing to barter. And I wasn't around long on the closing day that is notorious for good deals. I did find it odd that some dealers had signs posted saying they weren't offering further discounts beyond what they had things priced at. For me, it usually meant I just moved on to the next dealer as their prices didn't seem that great to begin with. The biggest deterrent for me wasn't prices, though. It was organization. Several stalls had plenty of singles. But they were just tossed in monster boxes and collectors were left to fend for themselves. If you have one or two cards on a list to finish a set, this can be easy to navigate. But more than that, it would be a waste of time. On the flip side, there were a few booths that had lots of singles and they were all organized by set and number, making filling a want list easy and fast. These dealers were, for the most part, busy because they seemed to understand how precious time is for collectors at a show the size of the National. Even though it can be time consuming to sort through singles and put them in order, dealers can reach a bigger audience simply by keeping things organized. 5. Changes on the Horizon? The biggest news to come out of the 2014 National Sports Collectors Convention was Panini announcing they had secured exclusive NFLPA rights starting in 2016. But this may very well be the start of some bigger changes in the industry. All of the major sports bodies seem content on going the exclusive route. This means that bigger, stronger companies can bid higher and have a better chance at landing these licenses. It also means that smaller manufacturers are going to feel the squeeze. 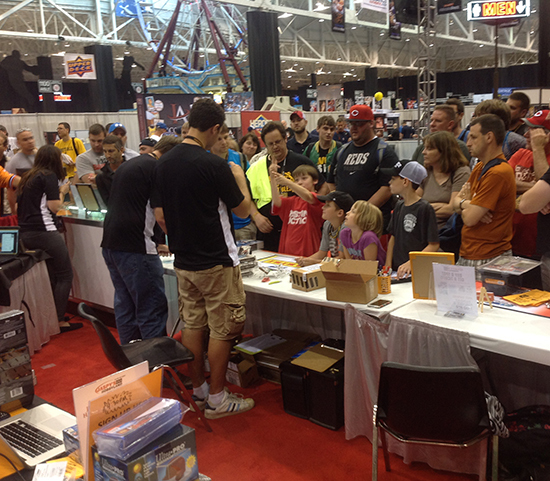 In the next couple of years, don't be surprised if there's some consolidation on the manufacturing side of the hobby. With only so many licenses to go around, something's got to give. Mike B � No prices posted is a pet peeve of mine. I didn’t take many of those seriously. I agree with all of the above. I was really hoping to come home with more from this show. I actually came home with money! I was also looking for mid to late 1990s cards and did not find much off my want list. I also wanted some more recent cards but was not going to take the time to look through 5000 random singles to find them. The signs saying the dealers would not deal were annoying. That is a major part of the hobby, making deals. I probably would have been better off staying home and buying cards off the bay in my underwear! What a phenominal experience. It was as if hundreds of card shops happened to ply their wares for a few days at one location. It was overwhelming at best. 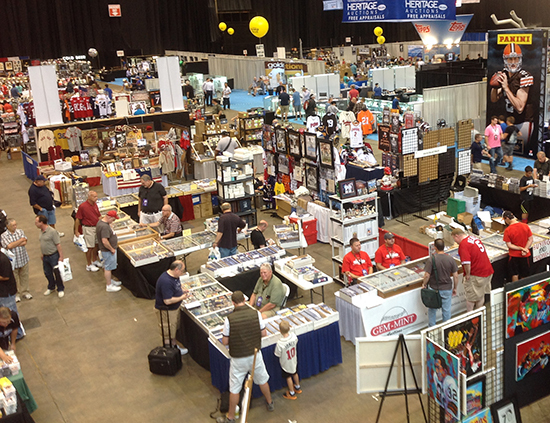 This was my first ever card show of any kind. I paced myself diligently throughout. Some of my highlights was viewing for the very first time, a T-206 1911 Honus Wagner card for auction, I was told that that card had a possibility of pulling in a high bid of $500,000.000! WOW! There were cards from the very elite all the way down to the $0.25 price range. As for organization and the ability to find what was on my list, I must agree that some dealers were less organized than others yet I went to this show with no expectations hence, I was not disappointed at all due to the fact that I had no list of cards. I went on Friday at the opening of the show of which was 10:00am and did not leave until 4:00pm. I came away with a handful of singles and a 2012 Panini Absolute hobby box. My prize and the joyous memory from this show lies in my Absolute break of which was a hit of a Andrew Luck RPA! What a way to end such a fantastic day. 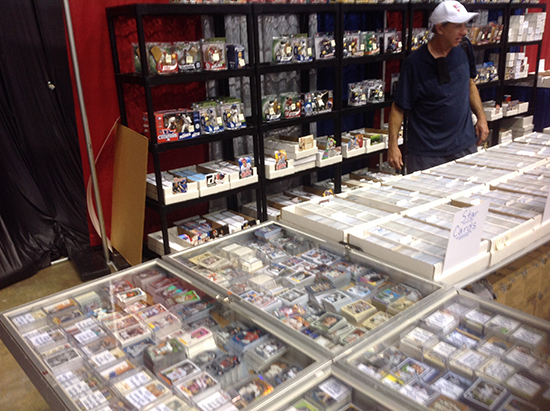 I would like to point out that as much as I went for the cards, it was the experience to meet fellow collectors and dealers from the simple base cards to the coniseiure of the elite collectibles. 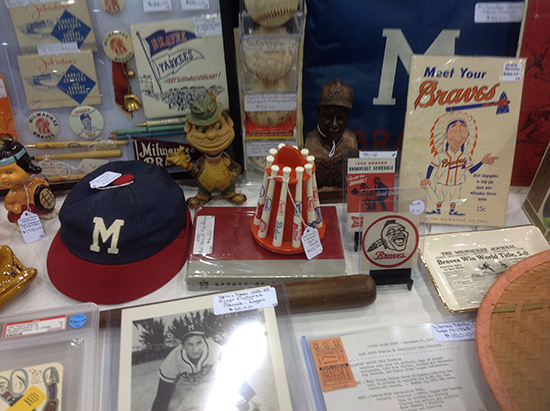 A plus was to experience the memorabilia of the hobby of which I have no experience of. Lastly, it truly was the bonding with my daughter and her boyfriend Brett whom introduced me to this fascinating and educational hobby! 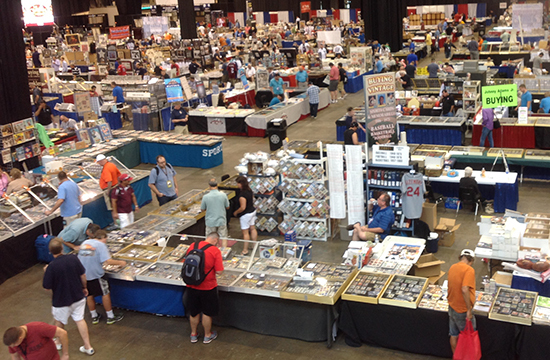 Please take the time out and read and reply to my thread in Cardboard Connections forum, Card Collectors World in Football Showcase entitled “National Card Show”. I wanted to add that if it was not for the very informative and educational aspect in my collecting of football cards via Cardboard Connection, I would have never come this far in the hobby in regards to my ever growing football card collection. I want to thank the entire staff at Cardboard Connection for their passion, dedication, countless hours of research, and hard work at being at the forefront of this hobby that I’ve come to love.